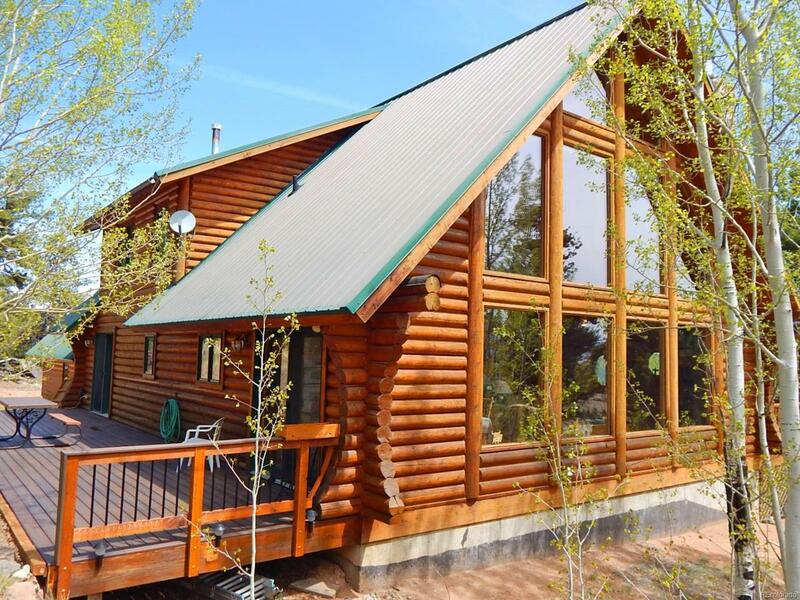 Cozy Rocky Mountain Log home with 8" logs, located on 6.34 acres with beautiful views of the valley. Top West side of the property views of the full Continental Divide. Beautiful covered front deck. 12/12 pitch roof making for a very grand feeling. This property is close to Spinny Reservoir, 11 Mile, Antero Res. & Tarryall Res. Great home for the outdoor enthusiast that is into fishing, camping & hiking. Great room offers Austrian hardwood flooring, very large windows & large rock wood fireplace. Open kitchen dining area with french doors out to the back patio. Kitchen is very spacious with nice kitchen island corian countertops, tile backsplash, electric cooktop, wall oven and wall microwave. Home has HWBB heat and also in-floor staple up heating in the great room & hallway. Upper lever offers nice family room, office area & 1/2 bath. Surround sound on upper level. 3rd bedroom is located above the garage so nice & private. Garage is heated. Nice RV concrete pad with all hookups.